In February 2003, Death Cab for Cutie vocalist Ben Gibbard and Jimmy Tamborello, who records electronic music under the name Dntel, released an album as the Postal Service called Give Up. For an electro-pop side project from two relatively unknown indie-rock musicians the album did surprisingly well, landing at number one on Billboard's Dance/Electronic Albums chart and placing in the top 20 on the Heatseekers and Independent Albums charts—the single "We Will Become Silhouettes" even cracked the Hot 100. Despite the unexpected success, Gibbard and Tamborello insisted on treating their collaboration like the side project it was intended to be, and after some promotional touring behind Give Up they put it to bed; the long-awaited sequel to Give Up seems less likely to happen with every passing year. 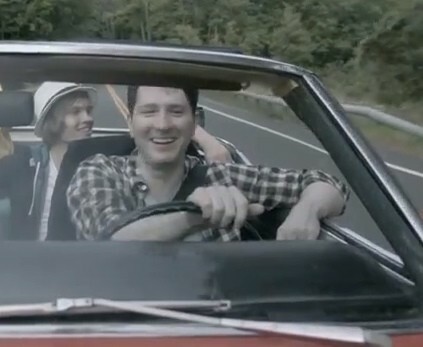 In April 2007 a young musician from Owatonna, Minnesota, named Adam Young released an EP called Of June under the name Owl City through independent online distributor CD Baby. Bolstered by a robust fan base mobilized via Young's social-networking presence, the EP reached number 15 on the Dance/Electronic Albums chart, and a follow-up LP, Maybe I'm Dreaming, hit number 13. Young's music was a virtual clone of Give Up, down to his almost disturbingly accurate impression of Gibbard's half-whispered vocals. At the time, though, it was easy to write off Young's blatant ripoff as naive youthful enthusiasm—this kid wanted another Postal Service record so badly that he went ahead and wrote it himself and posted it to MySpace. Fast-forward a half decade and Young is a legitimate pop star. His 2009 single "Fireflies" hit number one on the Hot 100, a far better showing than the Postal Service, Death Cab, or Dntel has ever had. "Good Time," the lead single from his most recent album, The Midsummer Station, is currently at number ten on the Hot 100, having spent 14 weeks on the chart and peaking last week at number eight. Despite the fact that Young cowrote the song with Brian Lee and Relient K front man Matt Theissen and sings it alongside "Call Me Maybe" sensation Carly Rae Jepsen, "Good Time" is still basically a Postal Service soundalike, with just a touch of Katy Perry to differentiate it from anything on Give Up. At the moment "Good Time" sits directly above "Everybody Talks" by the group Neon Trees, which has spent 29 weeks on the Hot 100, peaking at number six. Coincidentally, "Everybody Talks" sounds quite a bit like another group that was inescapable in the early to mid-aughts, the Strokes, whose biggest hit, "Last Nite," hit number five on the Alternative Songs chart but didn't make the Hot 100. Both Young and the members of Neon Trees are devoutly religious—Neon Trees are all Mormons, and Owl City's next single, "Shooting Star," has already reached number 36 on the Christian Songs chart. So basically two of the top songs on the pop charts right now are replicas of early-aughts alt-rock by out-and-proud religious types, and they're performing better than the originals ever did. Either the Postal Service and the Strokes were about a decade ahead of their time or the mainstream's taste in alt-pop is running about a decade behind. Or maybe the usual 20-year gap between when music is released and when it gets retro-revived has already collapsed by half. Or maybe Jesus has something to do with it.